It's not often that I wax rhapsodic about a 1911 pistol, but I'm about to make an exception for Les Baer's new Hemi 572. Don't get me wrong. I love 1911s, all 1911s. By actual count I own 18 of them (a man just can't have too many 1911s). But Baer's Hemi 572 is about as close to a perfect 10 as I ever expect to find in the 1911 world. And I'd be less than fully honest if I didn't also admit that Baer's inspiration for this particular custom pistol has a lot to do with how much I like it. That's because the Hemi 572 name is also a tribute to his fully restored 1970 Plymouth Hemi Cuda muscle car, which was one of the dreams of my own teenage years. Les Baer was almost as well-known in the heyday years of pro-stock drag racing in the late 1990s as he is today in the world of high-performance pistols. His debut of a radical, rules-pushing SN95 Mustang in 1998 at the Fun Ford Weekend in Ennis, Texas, caused an absolute outrage amongst the other competitors and forever changed the face of the sport. And Baer's background in high-performance auto racing explains a lot about the way he builds his guns. He treats his 1911s the same way he treated building engines for his ground-breaking dragsters. Like those engines, his 1911s are precisely and tightly fitted, with a strong emphasis on extreme accuracy. All his high-end custom 1911 models are guaranteed to shoot three-inch groups at 50 yards, right out of the box. Among precision 1911 builders, Baer has always been particularly known for his bullseye pistols, which are the preferred tools of many champion shooters. Not that his 1911s are not also renowned in the tactical trade, as witnessed by the fact that Clint Smith of Thunder Ranch chose Baer Custom to build the Thunder Ranch Special Home Defense Pistol line of 1911s, citing Baer's outstanding accuracy and reliability. The new Baer Hemi 572 embodies both those characteristics. Like Baer's own '70 Hemi Cuda, his 1911 Hemi 572 has sleek, classic lines combined with high tech features to provide guaranteed powerful performance. The basic platform is based on the acclaimed Baer 1911 Premier II pistol, which Les modestly believes is the best single-stack duty, defense or competition pistol you'll find in America. And it's no hype that it sets the standard for accuracy among competition shooters. Based on sales, it's the flagship of the Les Baer line. Both the Premier II and the Hemi 572 start off with Les Baer National Match frames, slides, and barrels, which are worth a bit of discussion in and of themselves. Baer's match frames are more than just the foundation on which he builds his guns; he believes they are the primary building block on which his business and reputation have been built as well. Baer Custom makes its own frames, fully machining them on the company's state-of-the-art CNC equipment and holding the tightest tolerances in the industry to guarantee consistency. All Baer frames come standard with beveled magazine wells, and his frames (both chrome/moly and stainless) are available to other pistol builders either individually or paired with Baer slides, individually hand-fitted for the best possible fit. All the pistols he builds have hand-fitted frame/slide interfaces as well. Baer's slides are equally high grade—and like the frames are machined in-house, after heat-treating to 40 R.C. The rail dimensions in particular are machined to ultra-precise, uniform specifications, and the barrel channel is bored for perfect alignment. In addition, the slides have 9mm firing pin holes to keep primer flow to a minimum, and the recoil plug is machined all the way through, so no additional drilling or reaming are required to install reverse recoil plugs. A lowered ejection port is standard, as are rear cocking serrations and front serrations on all five-inch slides. As for Baer's NM barrels, his emphasis on accuracy for his guns really shows. They're built from 4350 steel, and all critical areas are made oversize to allow proper individual precision fitting by other pistolsmith customers as well as Baer's own crew of expert pistol builders. The rear locking lug is also slightly oversized to allow you to obtain a central firing pin hit. The smoothness and consistency of the bore and rifling are remarkable. All other parts on both the Premier II and the Hemi 572 are also Baer-designed, refined and made in-house to allow precision matching of all parts' tolerances and dimensions. These include a tuned and polished extractor, a Baer extended ejector, Baer's checkered slide stop, the Baer Deluxe matched Commander hammer and sear, Baer extended ambidextrous safety, a Baer beavertail grip safety with raised memory pad, and Baer's speed trigger set for a crisp nominal maximum four-pound pull. The feed ramp is polished and the barrel is throated. Beyond these basics (and a pretty impressive set of basics they are, I'd say), the Hemi 572 offers several new and additional features. The Hemi features a Les Baer Custom adjustable low-mount rear sight, paired with a Les Baer fiber-optic dovetailed front sight with green insert (the green just happens to match the color of Baer's '70 Hemi Cuda). The high-cut frontstrap is checkered at 30 l.p.i., and the flat mainspring housing is checkered at 20 l.p.i. The frame and slide have a natural satin hard-chrome finish. The operating controls and other externally visible parts are finished in matte black DuPont S. These include the slide stop, ambidextrous safety, magazine catch and magazine catch lock, hammer, trigger, barrel, plunger tube, hammer pin, sear pin, recoil plug and hex-head grip screws. The subtle overall effect of matte black contrasted with satin chrome is quite pleasing. Each Hemi 572 comes with two eight-round Les Baer Premium magazines. Again, these are of Baer's own design and manufacture and worthy of extended comment. 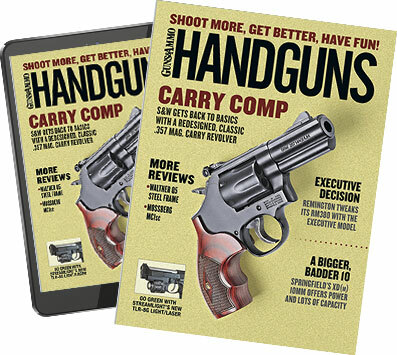 Baer says his team experimented for many months before he was confident he was able to offer the very best 1911 magazine on the market and not just a rehash of an existing magazine design. "We developed completely new tooling, used the very best stainless steel, and we adapted the best lip and follower designs we could find into the most reliable working 1911 magazines you've ever used," he says. I certainly won't argue. The inside of the magazine tubes is mirror-polished and glass-smooth to allow ammunition and the follower to glide effortlessly. The black polymer base pad is easily removable for cleaning. Baer selected VZ black G10 Recon grip panels for the Hemi 572. The VZ Recon design is a full golf-ball textured grip, featuring a thumb recess to access the magazine release for quicker reloads, and it sports a traditional 45-degree bevel at the bottom to help you access the magazine (important for users of flat-base magazines). This is a very aggressive surface pattern, made possible by the special characteristics of the G10 material. G10 is a high-pressure thermoset plastic laminate consisting of multiple layers of woven fiberglass mesh cloth impregnated with an epoxy resin binder. It can be produced with many layers of the same color (or different colors) to achieve a specific cosmetic look. Because G-10 is extremely hard, it can hold a sharply cut pattern very well—much better than wood, or even aluminum. The first comment heard from most of the people who have picked up the Hemi 572 since I've had it here for review has been, "Boy, those grips really bite!" Yes, they do. Far more than any wood or other polymer grips you've probably ever felt. I like them. Back when I was starting out as an IPSC shooter, I asked a wise old veteran how hard I should be gripping my gun. "Oh, about until blood starts dripping," he said. "You don't want it to be squirming around, especially if you miss your grasp a bit." The VZ Recons certainly won't squirm (although the manufacturer does say that shooting gloves might be advised if you have soft palms), and I like a gun that stays put—especially for a full-size, full-duty .45 ACP 1911. Besides, G10 is essentially impervious to stains from cleaning solvents, oils, lubes and sweat, and it does not warp, swell or shrink. There has always been a lot of discussion within the 1911 community about race guns versus duty guns in terms of reliability versus accuracy, based on the premise that a precision-tuned accuracy pistol can never be as reliable under adverse conditions as a more loosely fitted duty gun or a duty gun be as accurate as a close-fitted match pistol. Given his long-standing emphasis on accuracy and precision fitting, Les Baer's products have often figured prominently in such discussions. His response has always been that he stands completely behind the accuracy and reliability of his 1991s—as do his repeat and repeat customers. I'm not going to argue the issue (except to note that reliability is kinda important to competitive shooters, too), but I will say this: I've never reviewed a Les Baer 1911 that didn't perform flawlessly. Including the new Hemi 572. I put our review sample through a performance review with five different brands and types of commercial .45 ACP ammunition, none of them "match" loads. The Hemi 572 performed flawlessly with all; no stoppages, no failures to feed, no malfunctions. You don't want to "soft-grip" it, but doing that invites cycle failures from any 19111. As for accuracy, well, I'm not really qualified to speak to Baer's three inches at 50 yards guarantee. My aging eyes just can't resolve iron sights and target well enough at that distance any more. But I can say that I don't think he's blowing smoke, since the overall combined average for all the groups I did shoot at 25 yards was only 1.67 inches (see accompanying chart). I know this gun, like nearly all guns, is capable of shooting better than I can shoot it. And, when you think about it, why would anyone ever want a 1911 that wouldn't? It's gonna be really hard for me to send this one back.